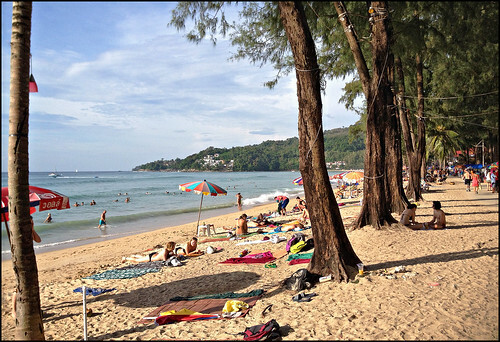 Just before New Year I had a free day and felt like checking out Kamala Beach. There have been a lot of changes to the beaches in the low season with the army helping to provide the muscle to clear all structures off the sand, and helping to enforce new regulations keeping beach chairs off the beaches. Some people think this is great, some want their beach chairs! Just this week there have been moves to allow chairs on some parts of some beaches, but .. are they really needed? 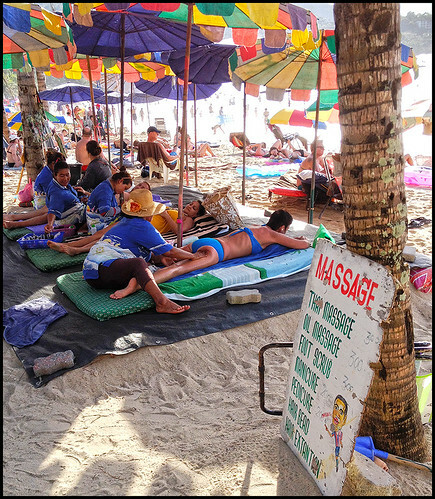 I blogged a few months ago about these changes and visited Surin Beach, Layan Beach, and Laem Sing Beach. Kamala used to be a place we visited often as we had quite a few friends living there, but I think in the last 5 years we've only been a few times! 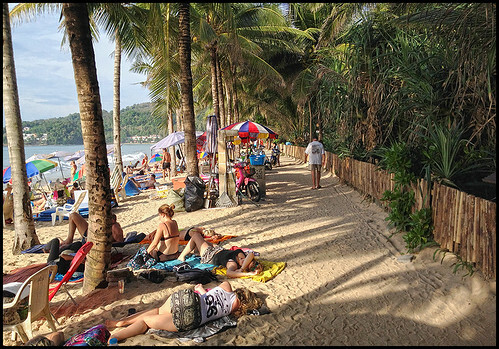 Kamala always used to be quieter than the 3 main beaches (Patong, Karon, Kata), but I know there has been development and new hotels. 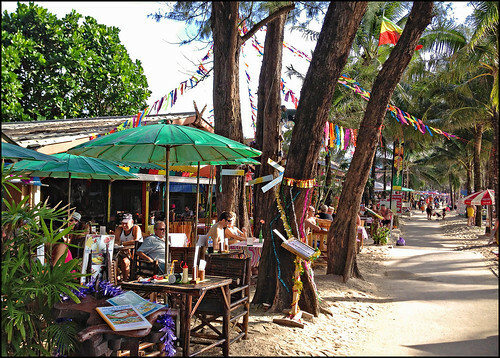 The middle section of the beach always used to have a lot of small restaurants right on the sand. I was guessing these would be all gone. Wrong! So, as you can see from the photo above, there are still restaurants right by the beach. The change is that the restaurants now have no chairs/tables *on* the beach, which leaves the beach free for people to relax. Between the beach and the restaurants is a concrete path a couple of metres wide, and the path is mostly covered in sand, plus the floors of many of the restaurants are sandy. So .. you're pretty much right on the beach. Nice. I had parked at the police station which is closer to the south end of the beach than the north. There used to be a couple of restaurants there, but they had 100% gone. Walking north is a line of beachside restaurants for about 200 meters. The beach was pretty busy, there were a few chairs, quite a few beach umbrellas and a lot of people lying in the shade near the path under the trees. Kamala is quite a small beach and development is limited because at the south end you have Kamala temple and school plus the very south of the beach is very shallow and a little muddy. And the north end of the beach has no development since the land that fronts the beach is a Muslim cemetery. Walking north past the row of restaurants the narrow concrete path continues onwards, but there are no buildings. There are a few mobile stalls selling food and drinks and a few people have got chairs and tables on the beach there. Space is limited, and I saw people lying almost on the path! I mean, the beach is big enough, but people like to crowd the center. If you walk 100m you find some space! And yes sure it was a little crowded, between Christmas and New Year - absolute peak season. 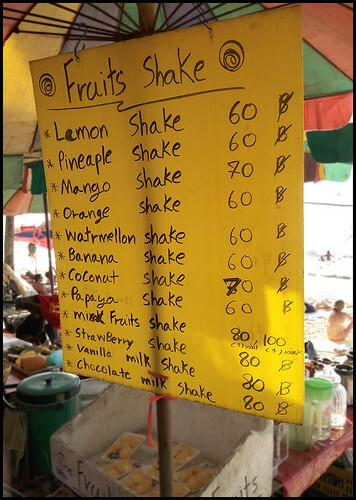 Aside from small restaurants there were also lots of stalls selling fruit shakes and juices. One of the lovely things about living in a tropical climate - no shortage of lovely fruit! After a little walk up and down the beach on a hot afternoon, I think you'll agree nothing hits the spot like a cold beer. So I stopped at "Bob's Bar" for a Chang. Having a place to eat or drink right by the beach is great. I'm happy to see natural looking beaches, but the authorities may have been a little over zealous in some places. Tourists like to sit on the beach, but do need shade and do need food and drinks. Kamala looks like it's got the balance right at the moment. 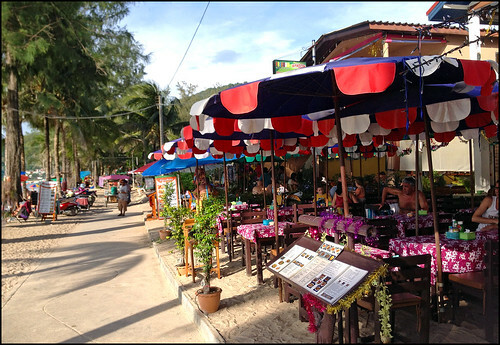 (above) Kamala beach - Bob's bar is there behind the green umbrellas. I could have very happily sat there and had a few beers, but I did have to drive home! So one cold Chang went down the hatch in about 3 minutes. I was happy to see Kamala prospering. My main memory of Kamala is being there on December 25th 2004 with my wife 9 months pregnant, a little daughter, everyone playing on the beach. And next day was the tsunami. So this was another reason for visit Kamala on December 28th 2014, 10 years (and 2 days) after that day. Good to see Kamala looking busy and the beach looking very well cared for.